It gives a full account, with illustrations of the disaster in Chile and the link with All Saints. It is written by Canon Keith Evans. On Monday 22nd February 2010 Oystermouth Parochial Church Council agreed unanimously that the historic Spanish bells presently housed in the porch at All Saints be returned to Santiago as a memorial to those who died in the fire at the Jesuit Church of Campania de Jesus in 1863. The three bells left All Saints Church on Friday 23rd April and will be carried on a Royal Navy ship to Chile, arriving in September 2010. NEWS UPDATE 2 Chilean firefighters visit All Saints. The three large bells on display in the porch at All Saints Church are of Spanish origin and date from as early as 1753. It is likely that they were cast in Spain and shipped to Chile. They are inscribed in Latin and in Spanish. The bells were presented to All Saints, in exchange for the medieval bells, by Graham Vivian of Clyne Castle whose family had many business connections in the copper ore trade in South America. The original intention was that the Spanish bells were to be broken up - but they were presented instead to All Saints. Graham Vivian is on record as having stated that he was unaware which Santiago they came from. 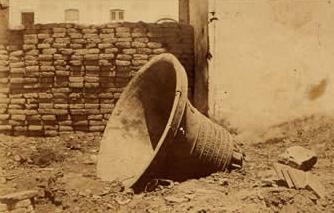 However the belief that these Spanish bells came from Sanitiago in Chile has been held for a very long time. After the fire tragedy of 1863 when the Jesuit Church de la Campana was razed to the ground in Santiago, the bells were sold for scrap and shipped to Swansea, blackened with smoke and installed in the Norman tower of All Saints. 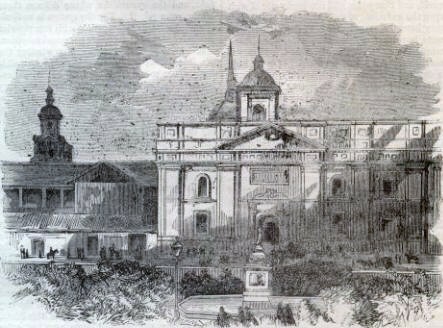 This was a decision of the Vivian family of Clyne Castle Swansea - who had business connections with the copper mines in Chile. In 1964 the bells were taken down from the tower as it could no longer support their weight. 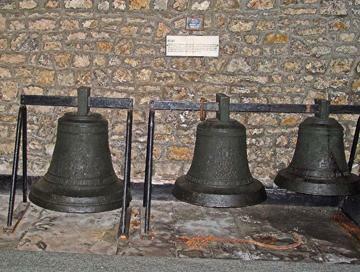 The bells are now on display in the porch and are pitched in D sharp (dated 1753), E sharp and F sharp (dated 1818). What happened? 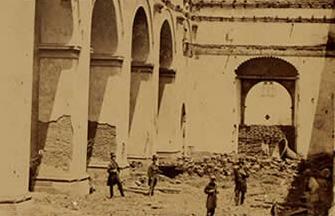 It was the evening of 8th December 1863 at Santiago. A great religious service was underway with over3,000 people present. The New York Times reported that it was a great triumph for the Clergy that so many attended. But the celebrations turned to tragedy. More than 2,000 people ( some reports claim 2,500) mainly woman, perished by fire. Bystanders were powerless to help, so intense were the flames. Each evening during the month, the Church shone with a sea of flames and fluttered with clouds of muslin and gauze draperies. It was reported that 20,000 lights shone that fateful evening. They could only light up everything by starting in the afternoon and the work of extinguishing was only ended late into the night. 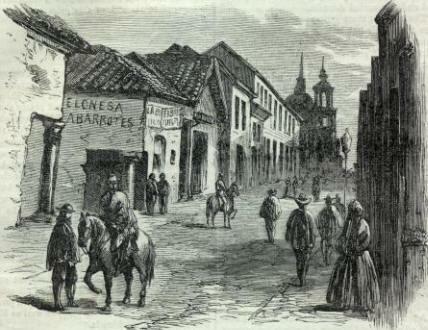 Here is an image from Harpers Weekly dated 1864. 8th December was a great feast day and in 1863 the Church was prepared as usual. 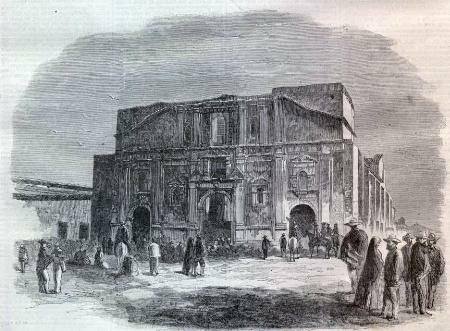 The Church could hold almost three thousand souls. 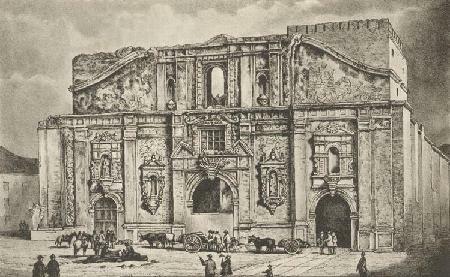 It possessed a spacious nave where the people would assemble. There was only one principal door. 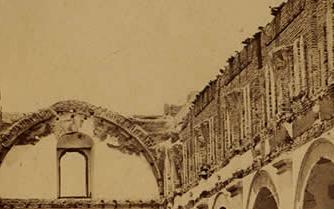 Many who had visited the Church in the past had complained of the suffocation caused by the smoke, the candles and danger of so many lights. But no measures were taken to prevent a serious accident. At 6 pm the doors of the Church were opened and around 3,000 women and a few hundred men took their places. It was crammed to overflowing. It was the 'Month of Mary' and no one could bear to miss the closing sermon of Urgate the Jesuit priest. The servant boys, or lamplighters, commenced lighting the lamps which were fuelled with hydrogen gas, or parafin or oil. The principal image of Mary was supported by a fine crescent of brilliant lamps in the centre of the High Altar. There is a report of a man who tied a rope to his horse and threw the other end of the rope into the mass of the people. Soon there was silence from the people, the screaming had all stopped, the Church was now a furnace. Suddenly the central dome crashed in the middle and with it the spire. Nothing now remains at the site of the tragedy, except for the garden and the mysterious and unique Ombu tree, a massive evergreen herb native to South America that spreads to 40ft wide (12-15metres) and upto 60 feet tall ( 12 - 18 meters). Its sap is poisonous.